Guilford Courthouse National Military Park contains approximately 149 acres, including the site over which much of the Battle of Guilford Courthouse was fought, and also the site of the original Guilford County Courthouse. 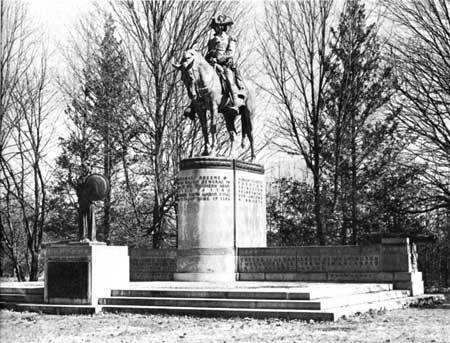 In the park are a total of 29 monuments and memorials, including a fine equestrian statue of Gen. Nathanael Greene. 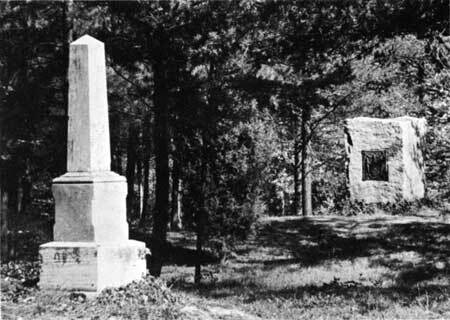 Buried in the area are the remains of six persons prominent in the history of the State of North Carolina. This guide has been prepared to enable you more readily to identify and appreciate some of the points of interest on the battlefield. Two numbered points, the Hoskins House and the Liberty Oak, are on privately owned land; all other points are within the park boundaries. Signs and markers on the ground lend assistance in following the flow of battle. Diorama of Col. William Washington's cavalry attacking British regulars. Peter Francisco, left foreground. 1. HOSKINS HOUSE. This house is the only structure remaining of those that stood on or near the battlefield during the Revolutionary War. The Hoskins family owned much of the farmland in the vicinity. The house stands in the area where Cornwallis halted his march and arranged his troops in battle formation to begin the assault. The house is said to have been used as a hospital for some of those who were wounded during the battle. 2. FRONT LINE OF BATTLE. The British approached from the west and attacked the American first line near the present park boundary. The line was about three-quarters of a mile in length with its center on the New Garden Road, where you are now standing. The North Carolina Militia made up the bulk of the first line. 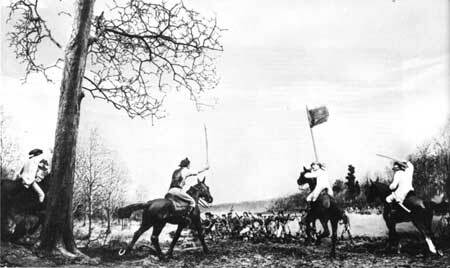 Untrained and without bayonets, they broke before the British massed charge. Regular troops on the flanks of the first line inflicted heavy casualties upon the British before giving way. The small monument in this area marks the remains of Capt. James Tate, of the Virginia Riflemen, who was killed near the Quaker settlement of New Garden, 3 miles west, in the skirmish which preceded the battle here. His remains were reinterred on this spot in 1891. 3. KERRENHAPPUCH TURNER MONUMENT. 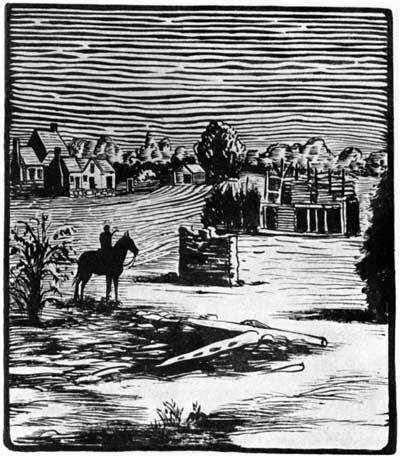 According to tradition, Mrs. Kerrenhappuch Turner rode on horseback from her Maryland home to nurse back to health a son wounded on the Guilford battlefield. Mrs. Turner lived to be 115 years of age and left many descendents, several of whom have been prominent in the history of North Carolina and nearby States. In this area are several other monuments. 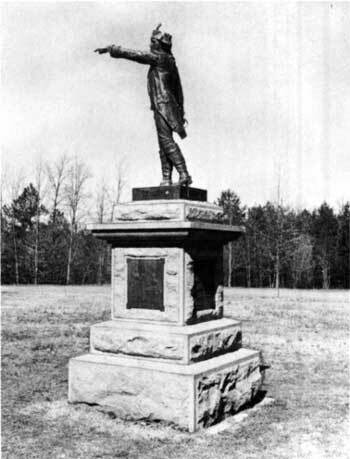 Beside the Turner monument is a memorial to Mrs. Turner's grandson, James Morehead, who also fought in the Guilford battle. Across the road is a memorial to Nathaniel Macon and gravestones marking the remains of Maj. John Daves and Gen. Jethro Sumner. All three men were Revolutionary War patriots. 4. NATHANAEL GREENE MONUMENT. The most imposing monument in the park is this memorial to the commander of the American forces at the Battle of Guilford Courthouse. It is located in the area where the Virginia Militia occupied the American second line. 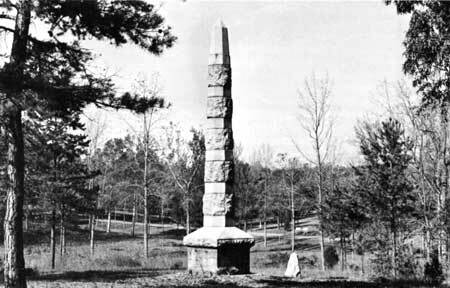 As early as 1848 there was an effort made by citizens of Greensboro to erect a monument to Greene on the battlefield. An organization was formed and funds raised in 185759, but this effort was dropped during the Civil War. In 1888 the first of a series of bills to erect such a monument was introduced into the United States Congress and in 1911 a bill to appropriate $30,000 for the purpose was passed. Work was begun in 1914 and the monument was unveiled with appropriate ceremonies on July 3, 1915. Francis Herman Packer was the sculptor. The central figure is an equestrian statue of General Greene. At center front is a symbolic female figure who is crowned with laurel. She holds two palm branches in her right hand and a shield ornamented with an eagle and 13 stars in her left. The monument is 35 feet high and the base is approximately 40 by 30 feet. The Delaware and Maryland Monuments. 5. DELAWARE AND MARYLAND MONUMENTS. 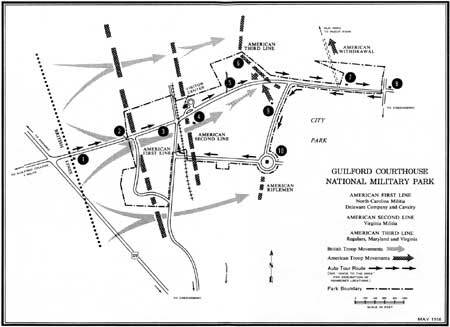 Delaware and Maryland regiments made up the bulk of the Southern Continental Army at the Battle of Guilford Courthouse. The Delaware Monument marks the grave of three unknown American soldiers who fell on the battlefield. 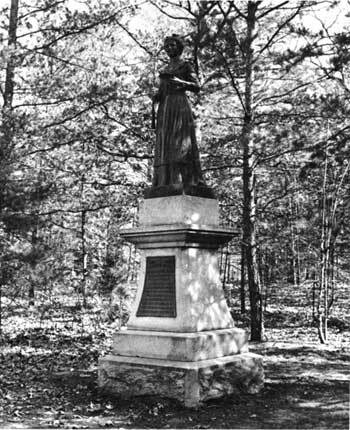 Their remains were discovered in 1888 and identified by coat buttons stamped "U.S.A." The Maryland Monument was erected by members of the Maryland Historical Society in memory of the soldiers of the Maryland line. Both monuments were dedicated in 1892. On the road nearby, Cornwallis, during the climactic phase of the battle, ordered two cannon charged with grapeshot to be fired into the hand-to-hand fighting being waged in the vale below. This desperate measure killed a number of his own troops as well as Americans, but it was effective in breaking up the fighting. The American Third Line Monument marks the midpoint of the line. 6. THIRD LINE MARKER. 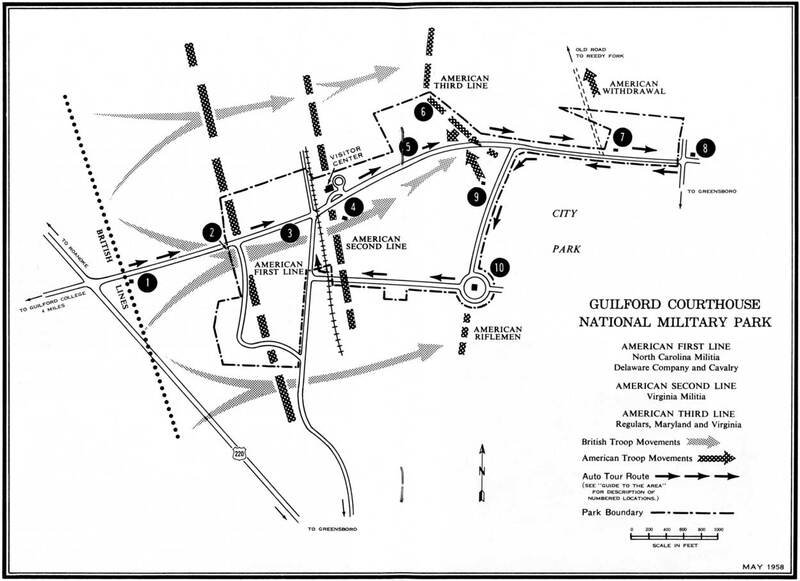 The American third line was composed of regular troops of the Southern Continental Armyabout 1,500 strong at the Battle of Guilford Courthouse. Thus it was at the third line that the British encountered the most resistance and where the hardest fighting took place. 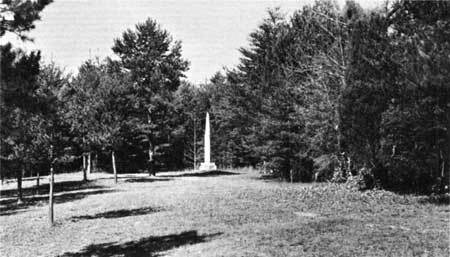 The tall white cenotaph marks the mid-point of the third line, which extended northward from the New Garden Road. The small monument near the road is a memorial to Lt. Col. James Stewart, leader of the 2d British Guards, who fell mortally wounded at this spot. His sword was exhumed here in 1866. Colonel Stewart can be seen leading the Guards in the action portrayed in the museum diorama at the visitor center. Chimney remnant of the original Guilford County Courthouse. After a sketch by Porte Crayon in Harper's, July 1857. 7. GUILFORD COURTHOUSE SITE. Guilford County was formed in 1771 and the first courthouse was erected at this location in 1774. Greene bivouaced his troops in the clearing around the courthouse the night before the battle. The courthouse, as the most prominent structure in the area, lent its name to the battle fought several hundred yards to the west. In 1808 it was decided that the county seat should be in the geographical center of the county, which was determined to be 6 miles to the southeast. A courthouse was constructed at the new location and the city of Greensboro (named for General Greene) grew up around it. As Greene retreated from the battlefield he withdrew eastward along the New Garden Road, then turned toward Troublesome Creek on a road that during the Revolutionary War ran northward near the courthouse. 8. LIBERTY OAK. On the morning before the battle, General Greene's men camped around this tree. A white oak, it has a circumference of 17 feet 3 inches at breast height and a spread of more than 100 feet. Francisco Monument, looking toward the American Third Line. 9. FRANCISCO MONUMENT. From this hill, Lt. Col. William Washington's cavalry charged the British Guards in the vale below while simultaneously the 1st Marylanders counterattacked from the edge of the woods. Thus was enacted one of the most dramatic scenes of the Revolutionary War. With Washington's cavalry was Peter Francisco, a giant of 6 feet 8 inches, who wielded a 5-foot sword given him by Gen. George Washington after Francisco's complaint that ordinary swords were too light. With his huge sword and mighty courage, legend credits Francisco with slaying 11 men in the battle. The monument was erected by Peter Francisco Pescud, a grandson of the Revolutionary hero. Unveiled in 1904, the monument is also a tribute to the Marquis de Bretigny and, through him, to all French participants in the American War for Independence. Winston Monument. Maj. Joseph Winston is shown giving his order to charge during the final phase of the battle. 10. WINSTON MONUMENT. Maj. Joseph Winston and Capt. Jesse Franklin led the Surry County Riflemen against the Hessians and Tarleton's dragoons in the last action of the battle. The figure atop the monument depicts Winston waving his troops into battle. Both Franklin and Winston were later prominent in North Carolina politics, with Franklin serving as Governor and Winston as a member of Congress. The city of Winston-Salem is named in part for the latter. The tombs of both men are located nearby, the remains being reburied here many years after the battle.